Canon announced the new EF 24-105mm f/4L IS II USM Standard Zoom lens back in August. It features an improved four-stop image stabilization as well as ghosting and flare reduction with air sphere coating. Delivery has been delayed till mid December for an estimated retail price of $1,099.00. I have owned the current EF 24-105mm f/4L IS lens for about 10 years and it is my favorite walk around lens for travel and wildlife photography. I am waiting delivery of the Series II model. After reading a few reviews of the new lens, the consensus seems to be it is a very good lens but not great and the improvements are incremental. Don't you just love that kind of platitudes? That description can be applied to almost any new lens. I have yet to come across a new glass that is head-and-shoulder over its predecessor and improvements are exponential. My readers know I am The Wildlife Ho-tographer and have used Canon gear for over a quarter of a century. My equipment are evaluated out in the field on photo shoots, under real world conditions. I know the new lens will not be the sharpest on the market but I expect the EF 24-105mm f/4L IS II to perform better in low light conditions with its 4 stop compensation, improved USM AF and new Air Sphere and Fluorine coatings. There is no one particular aspect of a lens that makes a great photo. It is always the combination of equipment, skill and luck that result in excellent photography. I expect the lens to work well with the EOS-1D X Mark II and EOS-5Ds. You can see my equipment bag and works on MichaelDanielHo.com Look for my review once I have taken the lens out on a few wildlife photo tours. By the way, if you just want a very good 24-105mm f/4L IS lens, they are selling a new Series I model for $619 (a great value). You will not find a link to Amazon for this item because I do not accept any advertisement or commissioned link on my Blog or website and do not solicit your email address for future spamming. I am completely unbiased in my reporting, have no conflict of interest and do not endorse any particular company. 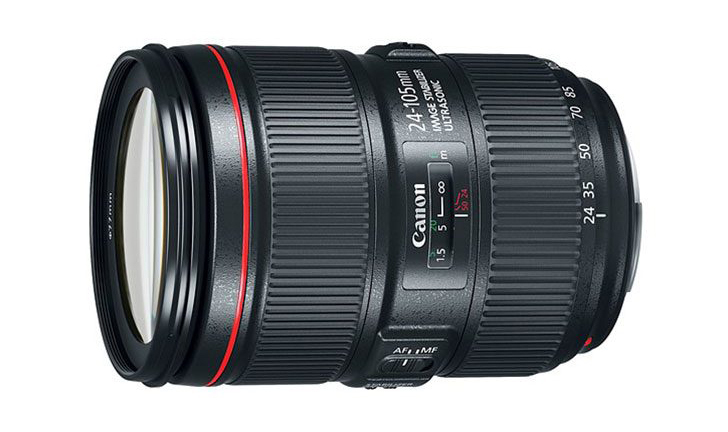 I have taken delivery of the new Canon EF 24-105mm f/4L IS II lens. It is about 1/2 inch longer but feels very good in my hand. Like all the new EF lens, the lens hood has a locking button and must be depressed first before removal. Look for my real world review once I start my wildlife photo tours in the New Year.